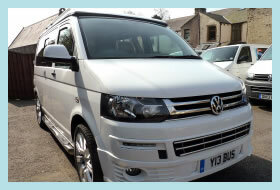 Teahupoo is owned by Russell McDonald who has been buying, selling and converting vw campervans in lancashire for over 30 years. He has owned over 40 VW camper vans, from split screens to bay windows, T25s and T4s, and currently drives a T6 on a daily basis. He has driven them all over Europe, from as far away as Sicily and Denmark. Nobody understands the needs of a T5/T6 owner more than Russell does. He has worked tirelessly over the past few years in perfecting the interior and exterior look of our vans. He also attends all of the VW exhibitions to ensure he is kept up to date with the market place and products available. We are based in the North West of England (15 miles north of Manchester city centre) and cover the whole of the UK. Indeed several of our enquiries have come from outside of Great Britain. We offer competitive rates for quality products. All of our interiors are handmade in our workshops by our fully qualified joiners and fitters. 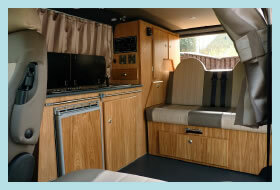 We do not use flat pack furniture as found in many of the homemade conversions or indeed better known companies. 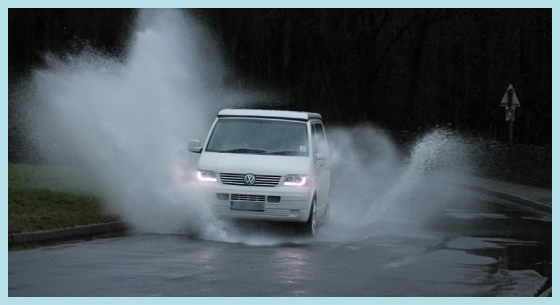 Our chief objective is to make holidaying in a Volkswagen T5/T6 a very enjoyable and stress free experience, ie The water tank holds enough water for a weekend holiday, so there’s no need to be taking hosepipes and attachments to refill whilst away. Space is a premium in a VW camper, so our cupboards are carefully planned.